LOYALTY REWARDS PROGRAMS HAVE A MASS REACH GLOBALLY and proliferate across airlines, travel, retail, card services, financial services, healthcare and other economic sectors. According to the 2015 Colloquy Loyalty Census, the average U.S. household participates in 29 different loyalty programs. That equates to over 3.3 billion consumer loyalty accounts in the US alone. Not only that, 84% of U.S. businesses provide some form of non-cash incentive awards to consumers, according to the Incentive Federation. Research tells us that consumers are looking for a rewards program that adds value to their experience. Unfortunately, they are all too often left feeling disappointed and frustrated as they juggle multiple programs that provide little value and complicated ways to earn and redeem points. Rewards programs must be simple to use while meeting the unique needs of every consumer. Consumers aren’t the only ones frustrated with the current loyalty process. Business also share that same love/hate relationship with rewards programs. While they love the potential it brings with consumer engagement and loyalty, they are faced with the recognizing the financial liability of a point at the time it’s awarded. This leads to exemptions, varying point values and changing terms, which are all designed to reduce corporate their exposure. Whether it’s a bank that offers cash back, a travel company that offers miles or a retailer that offers both, having so many programs with little value leads to a fragmented market and an average breakage of 35% in rewards that will never be redeemed. This does not help the rewards provider or promote loyalty. In addition, it is almost impossible to determine the true value of a point, because program rules are constantly being changed. This ends up hurting both the retailer and the member who never accumulates enough rewards to have a meaningful redemption. Because points are a growing liability on corporation’s books, corporations and program sponsors try to expire, complicate, and devalue the points as much as possible. This creates a conflict in driving true customer loyalty. Customers may feel rewarded when they earn a point, but they certainly don’t when they try to redeem them. Declining consumer engagement as demonstrated by unredeemed points. Increasing financial liability of unredeemed points. Rising management and administrative costs. Rewards.com, powered by both blockchain and cryptocurrency, is positioned to solve the challenges of the current business model of reward programs everywhere. Reinventing the rewards market and placing the power in the hands of consumers should create value, global reach and a better user experience. We intend to accomplish this by bringing a worldwide universal loyalty reward token to market for consumers and businesses. We believe that we have created an ideal ecosystem where the true value of the currency is fully recognized by consumers and rewards merchants. Rewards is single marketplace that brings together over 100,000,000 products and 7000 existing merchant relationships with restaurants, retail, entertainment, and travel that allows customers to earn and use RWRD token. 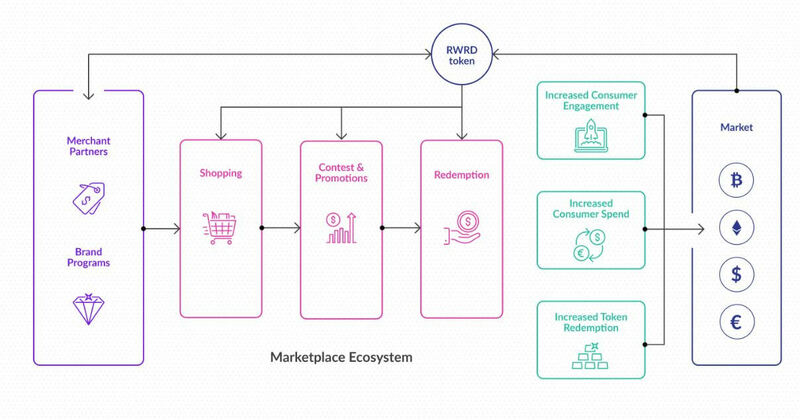 Our planned platform will allow users to shop online or in-store to receive RWRD tokens. Those RWRD tokens would then be used to make additional purchases clothes, food, book travel, buy gift cards or even tooth paste. Our ecosystem intends to provide a fully transparent market value for its tokens based on consumer engagement and behavior in the large rewards ecosystem. Our plan is to allow the rewards token can be converted to cash for presentation and processing upon redemption, consumers redeeming tokens are not limited by point restrictions, blackout periods and peak payment times. While the consumer has a lot to gain from our platform, merchants should benefit equally. Today, merchants with reward programs carry substantial balance sheet liabilities because of unclaimed points and rewards. That’s why Rewards.com plans to launch phase II of its Marketplace platform in 2019, allowing other program providers to join Rewards.com via a white-label loyalty program. Using the Rewards.com blockchain platform, should enable merchants to reduce or fully eliminate balance sheet liabilities associated with reward points and maintain brand control and promotional discretion of their own rewards program. The white-label Rewards.com blockchain platform should allow other brands to leverage the strength and value of the entire Reward Token ecosystem. Phase II’s purpose is to create a platform with a publicly known and trusted protocol that any business or entity can use to offer their own Rewards program. Rewards.com is a leader and pioneer in consumer loyalty and rewards marketing. Rewards.com’s team has a proven track record of consumer engagement with years of experience in the design, development and management of complex loyalty and rewards programs. By listening to the needs of customers and learning from the experience of managing some of the world’s largest consumer loyalty programs, they have gained expertise and trust in this booming industry. Before forming Rewards.com, the team found a niche in developing custom programs to drive consumer behavior, launching programs for American Airlines, American Express and InterContinental Hotels. Soon the company was sought after by the top Fortune 500 companies for their experience and expertise in software development, mobile apps, social apps and other technology services for enhancing consumer engagement. The team’s 120+ years of combined experience in both loyalty marketing and technology development drives the company’s product innovation and development of 15+ years of successful relationships with top merchants including Walmart, Groupon, Lowe’s, Macy’s, Target and many others.